2, ensure that you dont weed them out by mistake and you will have plenty of new plants every year (and probably spare to give to your friends). Both of these activities can be served perfectly by completely ignoring them!! This will be great news if your are planting for bees in a wildlife area and for those who like to keep a tidy garden then just be a bit careful. The trees are definitely flowering a little early and in very quick succession;Last week (end March) some of the plums flowered, this week the pears are in full bloom as are some of the 'crab apples' and our bramleys blossom is plumping up and looks ready to flower next week. This bee was caught by our neighbour on their Malus which is one big white ball right now. 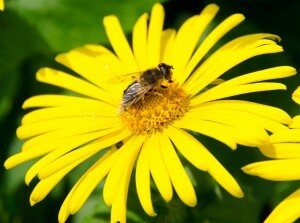 This means a continuous supply of very large volumes of both nectar and pollen. Because they flower over an area of both height and width, a fully grown fruit tree will provide as much of both foods as up to 10 times the acreage of ground-grown flowering plants. So this makes them a very space efficient way of providing bee-food. The pollen comes in quite a wide variety of colours and the brood cells inside our bee hives are beginning to resemble a colourful patchwork quilt. You can just about see the purple pollen in this pear. The only down-side is that they will be over all too soon. Still, beautiful while they last.